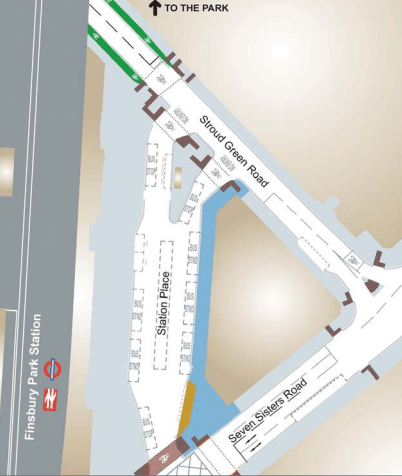 Sketch shows the 3 metre wide (blue) path to the right of Station Place that is expected to accommodate pedestrians and two way cyclists. The guidelines to the Connect2 project say ”Connect2 will create a new way of living, where people, and not cars, are at the heart of travelling within communities throughout the UK.” But not at Finsbury Park. One of the Connect2 partners in the Finsbury Park scheme, Transport for London has had a very different objective, to leave everything exactly as it is. The scheme will cost around £200,000 of precious funding, generously donated by the National Lottery, yet delivers little of benefit to commuting cyclists. Council officers argue that cyclists are now able to legally cycle south along the narrow pavement besides Station Place but at the cost of aggravating pedestrians and existing northbound cyclists. Local councillors at the last meeting described the scheme as “better than nothing”, ICAG does not agree. Please send your comments to Islington’s spatial planning and transport team via the official questionnaire (link below) or send the prepared email below. Edit it as you wish. If you cycle through Finsbury Park regularly or every day, please say so ! There is more information and links further down this page. The closing date is Tuesday 26th April 2011 and that has now past. Islington Council has been awarded £600,000 to spend on walking and cycling improvements on a new route connecting Finsbury Park to Highbury Corner. Thanks to everyone who voted for Sustrans’ Connect2 and for your help in winning the £50 million Lottery Giveaway, the largest ever publicly-decided award. The Islington Connect2 Route is one of 79 schemes UK-wide in the Sustrans’ Connect2 project, funded by the national lottery, which aims to encourage people to travel in ways that benefit their health and the environment, as well as creating a sense of community pride. The focus of the Islington Connect2 Route is to find a safer route for pedestrians and cyclists travelling through Finsbury Park, more specifically at the crossing of Seven Sisters Road. In August 2010, ICAG reviewed the latest drawings. On August 28th 2010, ICAG to objected to the proposals. In February 2011, ICAG received Connect2 Finsbury Park options and these engineering drawings: connect2-opt1 connect2-opt2 connect2-opt3. ICAG attended a Connect2 steering group meeting and here are our notes. On April 15th 2011, ICAG sent out this press release. The Connect2 project created an enormous amount of critical discussion on ICAG’s engineering email list. The focus of the discussion has been whether the proposals drawn up by Islington Council have merit, can they be improved upon or should the proposals be scrapped.